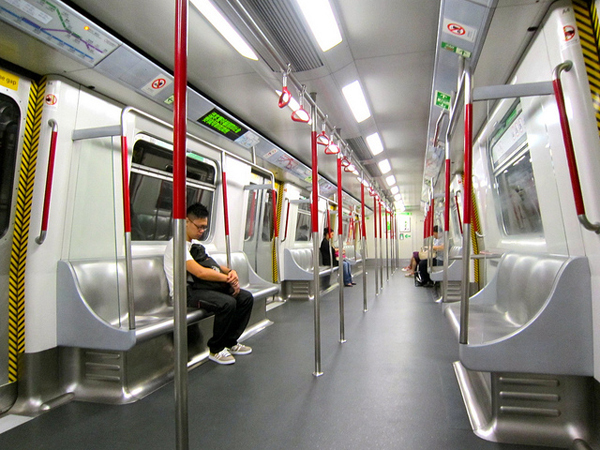 Very crisp shot of a nearly empty subway car in Hong Kong. The photo was taken with a Canon IXUS 210 point-and-shoot camera and no flash was used. Beautiful shot. One of the things I love about the Hong Kong system is the fact that the on-board subway line maps have little LED bulbs that illuminate, telling you are as the train moves through the system. Interesting to see how few seats they have in the subway. Hmmm. That LED thing sounds like a great idea! LA should jump on the bandwagon!